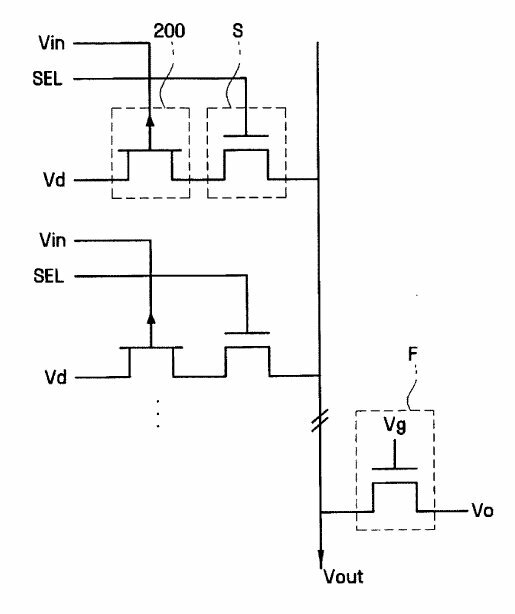 The SEFET pixel is said to be able to achieve a conversion gain of 1-9mV/e, as measured at the N-doped gate. Less than 1um pixel size is claimed to be possible. One thing I was unable to find in the Samsung application is how the N-doped gate is reset before the integration starts. 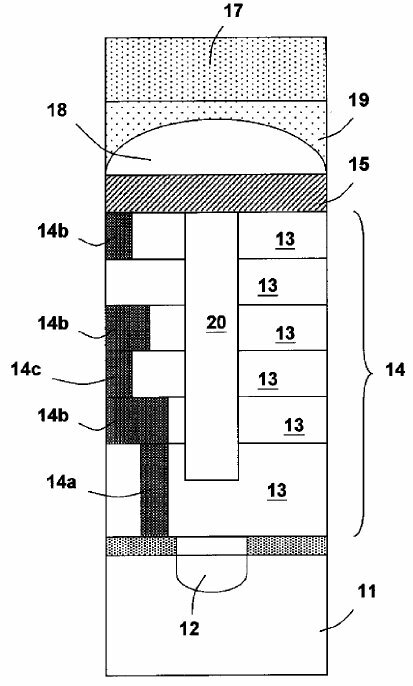 "Compared with the prior art, such arrangement is advantageous in that the micro lens 18 is located much closer to the photo diode 12. As a result, the micro lens 18 has a wider chief ray angle, and the photo diode 12 has a better light collection efficiency." 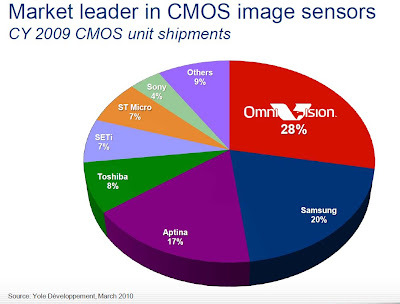 Forbes quotes Sony saying that it intends to win 30% of the market for image sensors used in mobile phones, up from an expected 10% for the fiscal year ended March 2011. Reuters: Sony will invest $1.2B in the next financial year to double its output of image sensors. The sum includes a deal announced last week to buy back a semiconductor production line from Toshiba, which has been estimated by an industry source at 50 billion yen ($600 million). It will convert part of the plant in Nagasaki, southern Japan, for the production of CMOS sensors and invest in wafer processing equipment for CMOS image sensors. The investment will bring its total production of image sensors, including CCD and CMOS types, to 50,000 300mm wafers a month by March 2012. Market Watch and Business Week too present their versions of the story. Update: Sony published an official PR here. "Sony Corporation ("Sony") today announced that Sony plans to invest approximately 100 billion yen in Sony Semiconductor Kyushu Corporation's Nagasaki Technology Center ("Nagasaki TEC") in the fiscal year ending March 31, 2012, to increase the production capacity for CMOS image sensors. 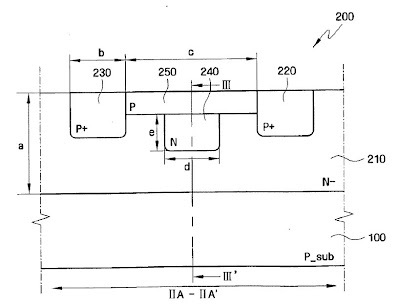 This investment plan includes (i) the transfer of the semiconductor fabrication facilities from Toshiba Corporation ("Toshiba") contemplated under a non-binding memorandum of understanding between Sony and Toshiba jointly announced on December 24, 2010, (ii) refurbishment of a part of the above semiconductor fabrication facilities into new wafer lines capable of manufacturing CMOS image sensors, and (iii) refurbishment and equipment of a part of production facilities at Nagasaki TEC Building 3 for wafer processing to differentiate Sony's CMOS image sensors with Sony's independently developed unique technologies. Through the investment plan, Sony will utilize a governmental subsidy to be provided by the Ministry of Economy, Trade and Industry in Japan - the "subsidy for programs to promote siting low-carbon job-creating industries" - mainly in connection with the investment mentioned in (iii) above." Chipworks got a hold of Samsung S5K4E5 - a 1.4um pixel-based 5MP 1/4-inch mobile sensor. 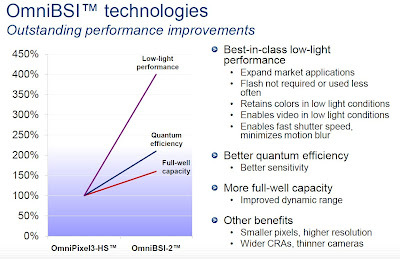 This is said to be Samsung's first BSI sensor with TSV technology. 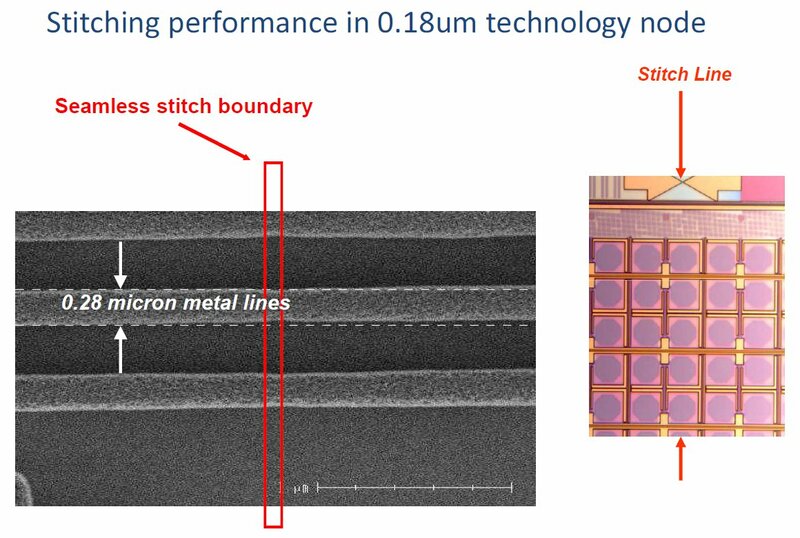 Samsung has indicated that it uses a lower-cost bulk silicon manufacturing process which they estimated to be 4x to 5x lower wafer cost compared with SOI. Business Wire: Optrima announced it has reached mass-production quality for a consumer electronics 3D, video (HD) and audio camera. 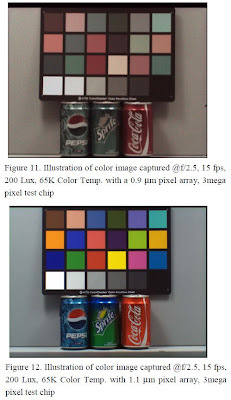 The camera, the result of collaboration with its partner Namuga, is said to be the world’s first embedded 3D camera with high definition RGB. "The availability of a high-performance, low-cost 3D camera with built-in audio and video will dramatically contribute to the adoption of 3D gesture-based interfaces and applications by consumers," said Andre Miodezky, CEO of Optrima. "We’re very excited to be the first company to bring such a product to the market and look forward to working with our customers to bring the product to the market in 2011." Consumers will be able to utilize the camera for gesture-based applications such as video games, interactive, touch- and controller-less user interfaces, as well as video conferencing and other exciting new user experiences, whether on desktop computer systems or connected TVs. Reuters: Sony plans to buy back a Nagasaki semiconductor plant from Toshiba Corp for about 50 billion yen ($597.2 million) to double output capacity for CMOS image sensors used in smartphones and other devices, the Nikkei business daily reported. Sony sold it to Toshiba in 2008. Acquiring the plant back will double Sony's image sensor output capacity to the equivalent of about 40,000 wafers a month, the daily said. By boosting output and lowering production costs, Sony aims to catch up with such firms Samsung and U.S. players in the CMOS sensor market, Nikkei said. Update: EETimes publishes an article with details about the March 2008 complex deal between Toshiba and Sony. Update #2: Reuters quotes Sony Executive Deputy President Hiroshi Yoshioka saying in an interview this week that it was in the process of deciding how to cover a shortage in CMOS sensor output capacity. Update #3: Sony published an official PR here. 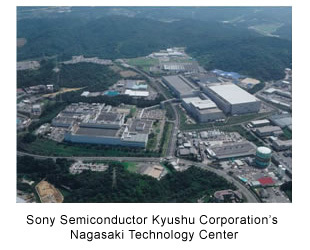 Nagasaki Semiconductor Manufacturing Corporation (NSM), which was established in March 2008 and is located in the Nagasaki Technology Center of Sony Semiconductor Kyushu Corporation ("SCK"), has been manufacturing the high-performance "Cell Broadband Engine" processor, the graphics engine "RSX" and other high-performance semiconductors and leading-edge SoCs for applications in digital consumer products of Toshiba and Sony. The facilities to be transferred would be the fabrication facilities and equipment for the 300 mm wafer line located within the Nagasaki Technology Center purchased by Toshiba from Sony and SCK and leased to NSM in 2008 and other facilities that Toshiba and Sony will agree to transfer among those in which Toshiba invested in connection with the operation by NSM after the purchase. Business Wire: Teledyne and DALSA jointly announce that they have entered into a definitive agreement that provides for the acquisition of DALSA by a wholly-owned subsidiary of Teledyne. The aggregate value for the transaction is approximately CAD $341 million, taking into account DALSA’s stock options and net cash as of September 30, 2010. That represents a premium of 27.7% over the twenty-day volume weighted average trading price. Headquartered in Waterloo, Ontario, DALSA has approximately 1,000 employees worldwide. For the twelve months ended September 30, 2010, DALSA had sales of approximately CAD $201 million. "I view this transaction as a natural evolution for DALSA and a positive development for all DALSA stakeholders including shareholders, employees, executives, local communities, customers and vendors," commented Dr. Savvas Chamberlain, Chairman of the Board and Founder of DALSA. "The decision to be a part of a larger organization recognizes that in order for DALSA to become a billion dollar company, we need to team up with an industry leader with complementary technologies. Finally, as the founder of the company, I am pleased to see DALSA’s name live on, in its new incarnation as Teledyne DALSA." 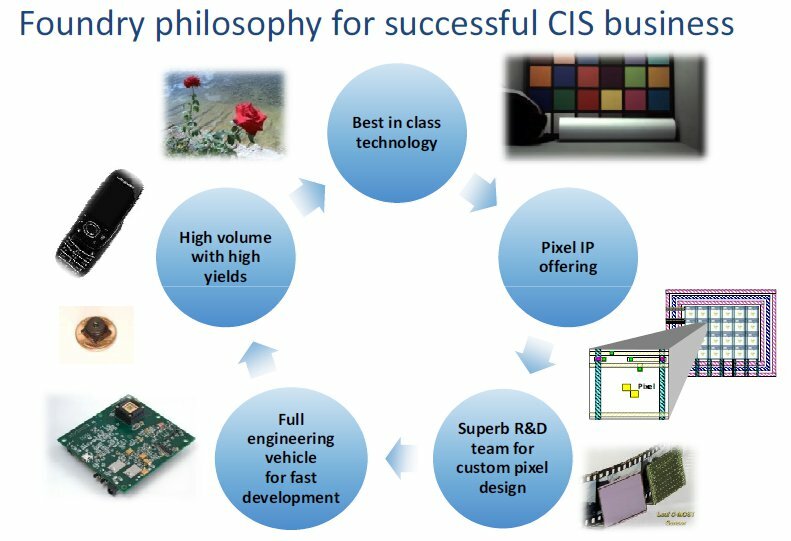 "Teledyne and DALSA are each acknowledged leaders in digital imaging technology but our product lines and customer bases are almost entirely complementary. 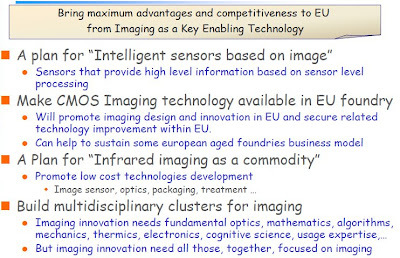 For example, DALSA produces among the world’s most advanced visible light imaging sensors and cameras for commercial applications, while Teledyne produces extreme resolution infrared sensors and subsystems primarily for government applications," said Dr. Robert Mehrabian, Chairman, President and CEO of Teledyne. "The combined strengths of Teledyne’s and DALSA’s leading imaging technologies will allow us to develop new infrared and visible light products that serve our respective markets and customers." The definitive agreement contains a termination fee in the amount of approximately CAD $10.2 million, which is payable by DALSA to Teledyne in certain circumstances if the transaction is not completed. DALSA and Teledyne expect that the transaction will close in February 2011. Update: EETimes too published an article with some more background about DALSA and Teledyne. Business Wire: Ambarella announced the iOne SoC HD camera for Android OS platform. The iOne is based on a triple ARM CPU architecture. Dual-core 1-GHz ARM Cortex A9 CPUs provide the horsepower to run Android applications while a third 533-MHz ARM-11 handles real-time camera tasks and enables camera boot time of under one second. The camera part supports simultaneous still photography and HD video recording - up to 32MP still image processing with high speed capture of 5MP images at 30 fps, and Electronic Image Stabilization (EIS) with CMOS sensor rolling shutter correction. The iOne SoC is sampling now to early access customers. 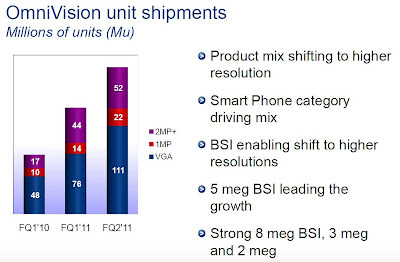 Venture Beat adds that cameras with the iOne chips will likely appear in the second half of 2011. Ambarella has 350 employees. 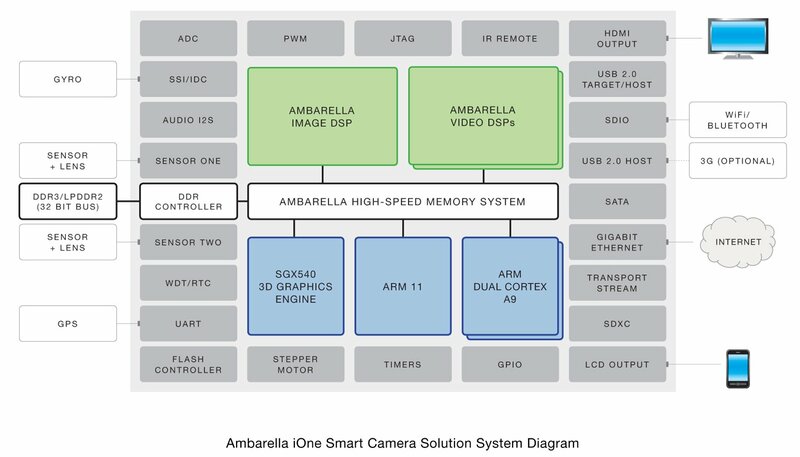 Current Ambarella chips are used in devices such as the Sony Bloggie video camera and a host of others. ReportLinker: Varioptic aims to raise EUR 10 million (USD 13.1M) during the first half of 2011 to finance a production capacity increase, French daily Les Echos wrote, quoting CEO Hamid Farzaneh. Eurogamer: Microsoft is working to improve the accuracy of Xbox Kinect so that it could detect finger movement and hand rotation. Kinect depth sensor is currently running at 320x240 resolution and 30fps speed, while its hardware could support 640x480 resolution. The issue relates to the USB controller interface, Eurogamer said. It is capable of around 35MB/s, but it only uses around 15/16MB/s. This artificial limit is in place because multiple USB devices can be used at once on Xbox 360. Now Microsoft is working on a technology to allow greater throughput in this regard. At a 640x480 depth sensor resolution Kinect could begin to detect fingers and hand rotation – an effective quadrupling of its accuracy. Business Wire: Cypress announced that its CMOS image sensor has been designed into 35 mm ALEXA digital motion picture camera from ARRI (Arnold & Richter Cine Technik GmbH), headquartered in Germany. A Cypress custom CMOS imager sensor also was designed into ARRI’s ARRIFLEX D20/D21 digital motion picture camera, which preceded the ALEXA. Taiwan Semiconductor Manufacturing Company, Hsin-Chu, Taiwan, R.O.C. 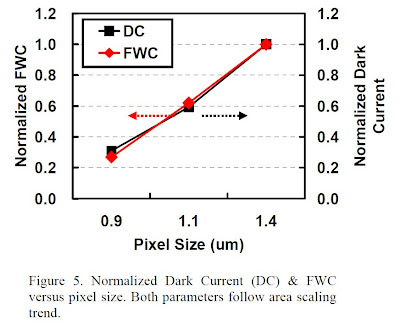 TSMC uses "Backside antireflection (BARC) layers to further enhance optical sensitivity." 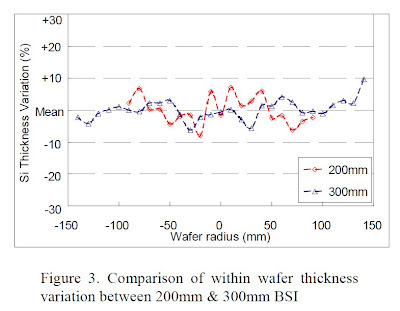 "wafer-to-wafer ... average thickness variation (are) within 3% of the mean value. 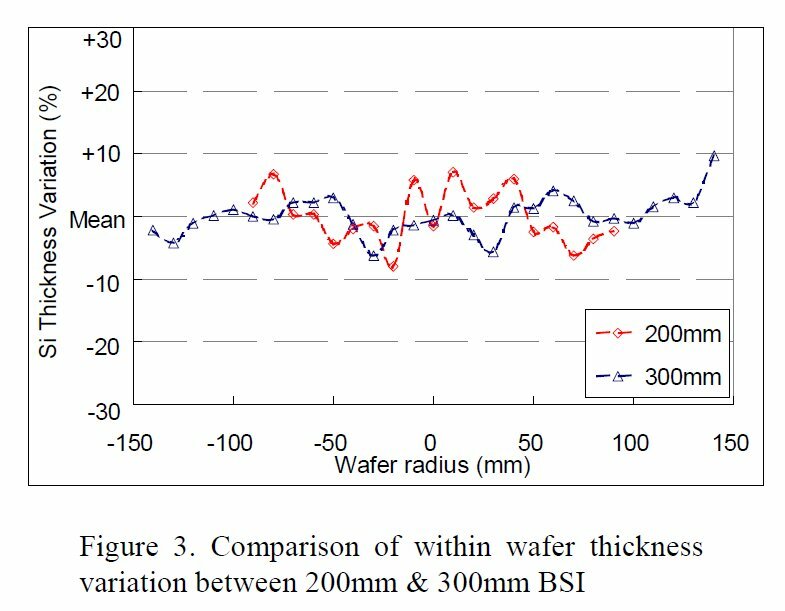 ...within-wafer TTV (total thickness variation) for 300mm wafers ... improved to be less than 15%, which is comparable to existing 200mm BSI process as shown in Fig. 3." Congratulations to S.G. Wuu and the whole TSMC team! I'm very impressed by your cutting-edge work! Chipworks reverse engineering report reveals that the primary depth sensing IR sensor in Microsoft Kinect is Aptina's MT9M001C12STM. This is 1.3MP sensor based on 5.2um pixels. Another Chipworks report says that the secondary RGB camera in Kinect is powered by Aptina MT9M112214STM sensor. I believe Chipworks meant 1/4-inch 1.3MP MT9M112 SoC. Richard Walker and Robert K. Henderson, Institute for Integrated Micro and Nano Systems, The University of Edinburgh, Edinburgh, U.K. Thanks to A.T. for the link! 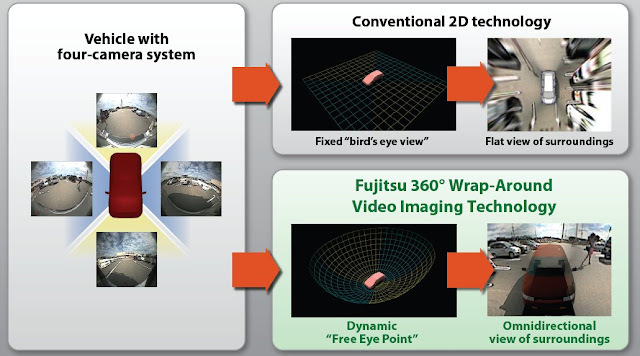 EETimes: Fujitsu 360-degree Wrap-Around Video Imaging Technology synthesizes images from four cameras to recreate an omnidirectional view of a vehicle's surroundings. The system designers can select the optimal perspective to give the driver the best view for any given driving situation. It is even possible to present a virtual "third person" perspective of the vehicle from multiple angles. The technology eliminates blind spots and provides visual assistance when the driver is backing up, turning corners or merging. The solution is based on Fujitsu MB86R11 "Emerald-L" 2D/3D Graphics SoC. Imaging Executive Podcast published an interview with GestureTek co-founder and president Vincent John talking about different projects with 3D cameras. TYZX is in the Guinness World Records Museum, not as record-holder, but as part of a new interactive display created by design firm Electroland. When pedestrians pass the Hollywood Boulevard, LA - located museum, the three TYZX cameras detect their presence and triggers the display 3D avatars on a series of large flat-panel displays. The avatars perform various world-record feats, such as juggling chainsaws. Update: Business Wire: Primesense announces the launch of its OpenNI (Open Natural Interaction) consortium, an industry-led, nonprofit organization formed to accelerate the introduction of Natural Interaction applications into the marketplace. The role of OpenNI is to certify and promote the compatibility and interoperability of Natural Interaction devices, applications and middleware, while encouraging developers to build applications and create experiences that will shape the future of Natural Interaction. Recently Hamamatsu has announced a number of silicon-based sensors with enhanced NIR sensitivity. 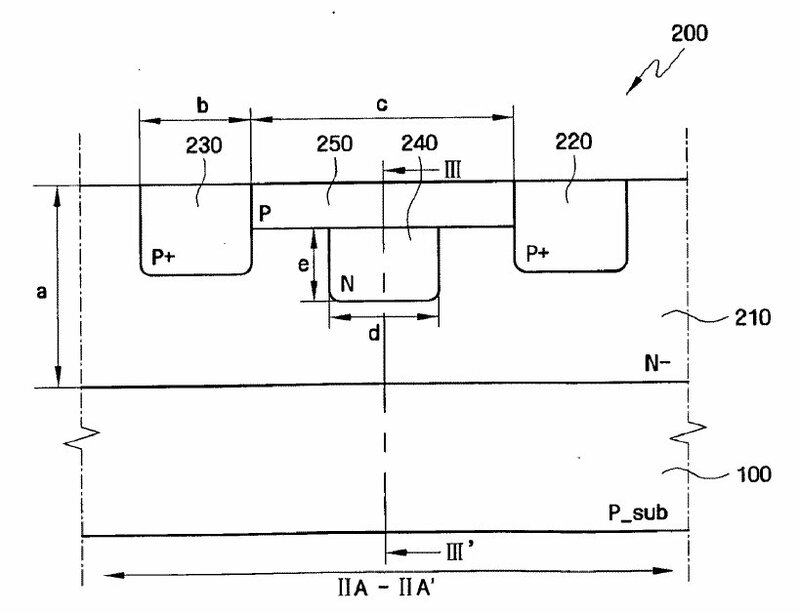 These sensors are said to utilize MEMS structures fabricated by using "unique laser processing technology" to achieve a significant enhancement of NIR sensitivity. 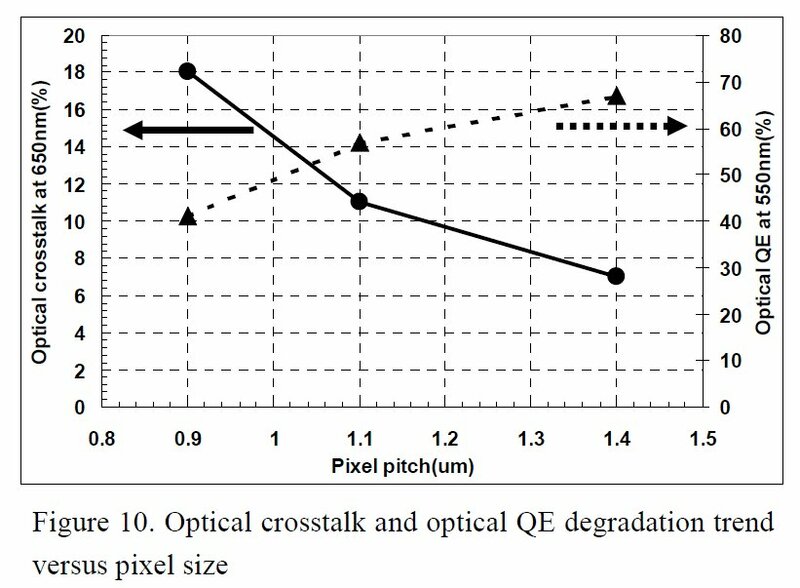 Another explanation of MEMS action is on Electro Optics site: "Using unique laser processing technology, MEMS structures can be fabricated on the silicon surface, which act to reduce reflections and increase the surface area of the active element. 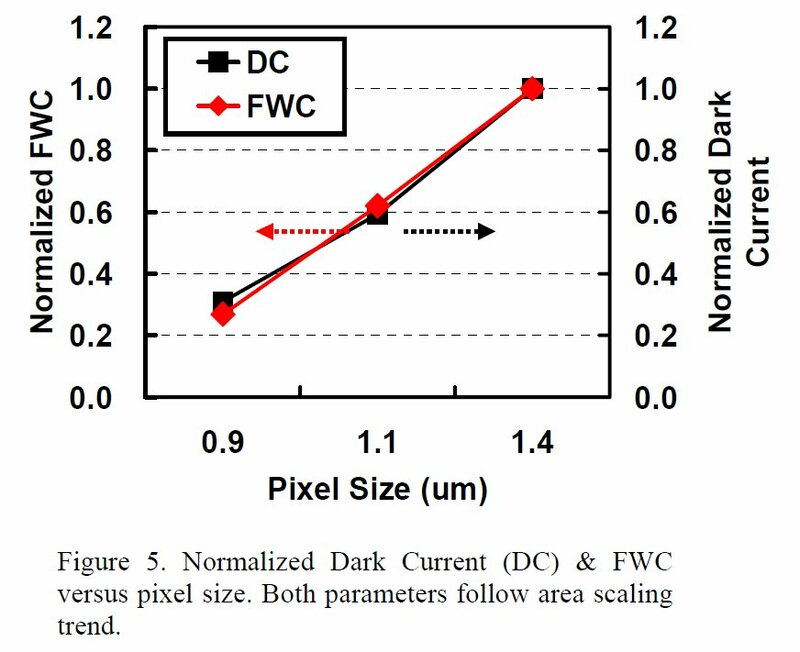 This process drastically increases the sensitivity in wavelengths longer than 800nm." 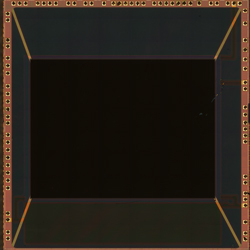 MDT: The S11510 BSI CCD features QE "of 40% at 1,000 nm, without the need for a deep depletion structure, with its corresponding drawback of higher dark signal. 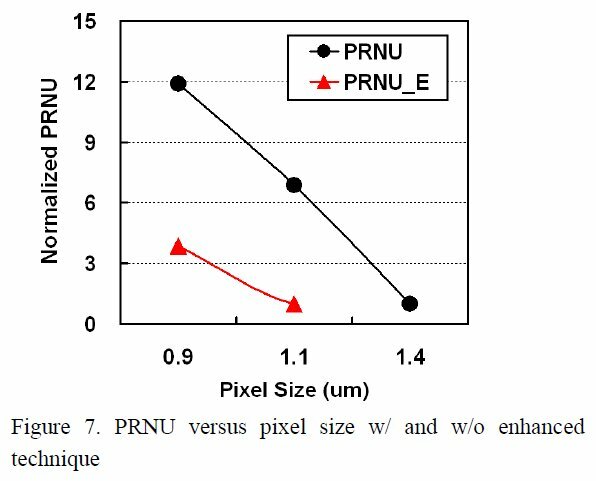 The S11510 series is available with 1,024 or 2,048 pixels, with each pixel measuring 14 by 14 µm." 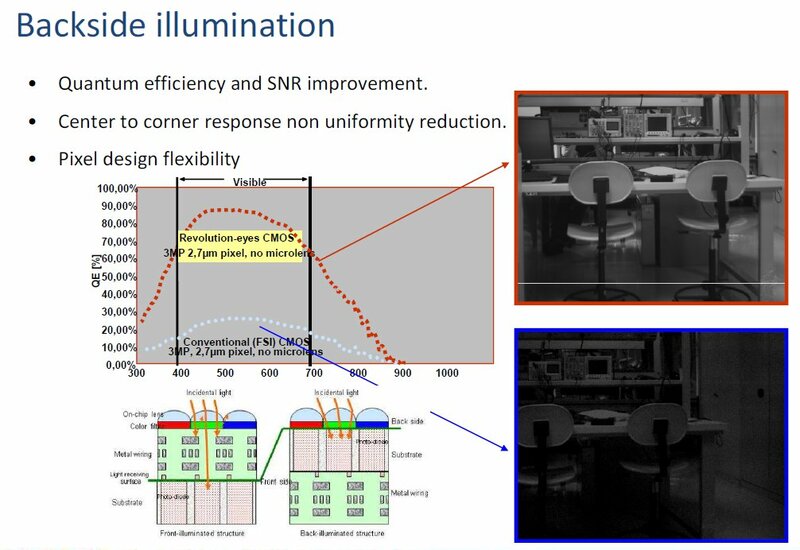 The new NIR CCD products have been announced about a year ago, but the PR had no reference to the MEMS technology at that time. JVC has developed high-speed camera processors able to work with 8.3MP 60fps video stream. The LSI enables shooting and recording Full 2D/3D HD at 60p fps speed, and also ultra-high-resolution 4K2K (3840 x 2160/60p) images of approximately four times the resolution of Full HD. 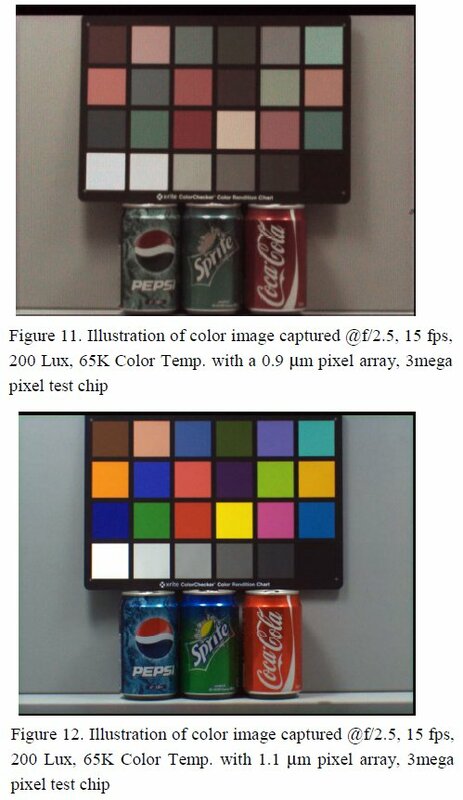 High-speed photography with high-speed processing also is possible, delivering JPEG processing at 8.3MP/60fps speed. 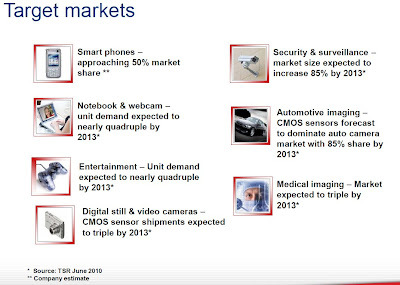 All in all, it seems that access to a lot of advanced technologies is now available to the smaller players on the image sensor market. Albert Theuwissen looks for the themes for his excellent blog, as PTC series nears its end. Nobody seems to propose the theme in two days passed since the request was posted, so I decided to duplicate it here. BioPhotonics published an article on small cameras and their endoscopic applications. 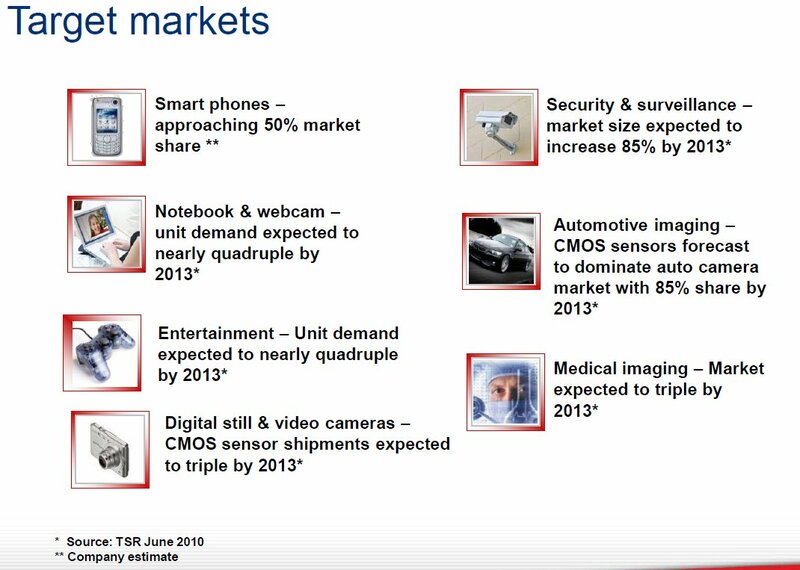 The overall endoscope market is growing at a modest 3% a year, said Teri Minor, a senior analyst at the technology market research firm Frost & Sullivan. 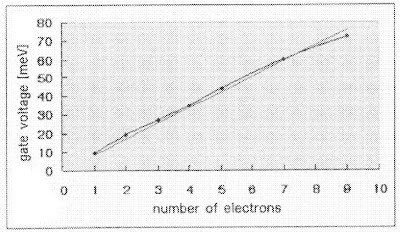 But there are segments within it, such as the gastrointestinal one, that are growing much faster. “They have new technologies, like capsule endoscopy, which have growth rates through 2016 that could be as much as 18 or 19 percent a year,” she said. Given Imaging second-generation pill-camera measures 11 x 26 mm and weighs <4 g. The camera snaps 35 pictures a second, and its wide field of view allows doctors to see twice the surface area of that seen with other capsules, said Given Imaging CEO Homi Shamir. In September 2009 Medigus Ltd. of Omer, Israel announced a 1.2-mm video camera, claiming to have produced the smallest such device in the world. Medigus currently is working with medical device companies and academic teams around the globe to incorporate it into various devices. As the company's product development manager Ariel Smoliar noted, Medigus' sensor fits approximately 50,000 (220H X 224V) of 2.2um pixels into an area that measures 0.7 mm on a side. 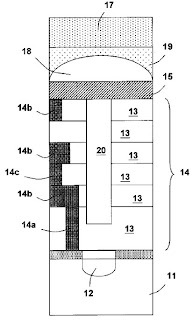 This is five times the number of fibers in a fiber bundle solution, making the small-area sensor effectively high resolution compared with that alternative. Measuring only 1.2 mm in diameter and 5 mm in length, this CMOS camera for medical applications is as small as the point of a pen. Inside the camera cylinder are a sensor, four lenses and a miniature printed circuit board connected to a four-wire cable. The camera is designed to be used in disposable instruments. The sensors for the Medigus camera are manufactured by TowerJazz. TowerJazz runs 8-in. wafers, which means there can be close to 50,000 half-square-millimeter sensors on each one. That multitude is part of what enables the sensors to be produced cheaply enough to render the camera disposable. The advantage of this approach is that it eliminates the need for sterilization between procedures, which can be expensive and a source of infection if not done properly. 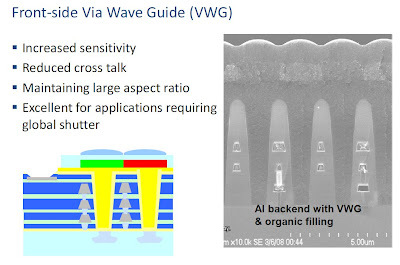 The small size of these sensors – as compared with those in other applications – is not necessarily the result of going with a smaller pixel, said Avi Strum, TowerJazz VP and GM. The need to capture clear images in low light makes it difficult – if not impossible – to shrink the pixels much from the size of those used in devices such as cell phones. Thanks to A.L. for sending me the link! Omnivision published its Wedbush Bus Tour Presentation dated by Dec. 2, 2010. Most of the slides are taken from the Annual Shareholder Presentation from Sept. 2010 with some updates. Electronic Design Magazine announced 2010 Best Electronic Design Award Winners. Omnivision OV7735 VGA sensor won the award in the sensor category. OV7735 is based on 3um FSI pixels, delivers sensitivity of 3300 mV/lux-sec and is said to enable less than 3mm camera module hight. The final program is yet to be finalized. Thanks to R.S. for letting me know! PR Newswire: TYZX announced it has received a substantial investment from Takata, a global manufacturer of automotive safety systems with more than 33,000 employees worldwide. The Takata investment follows an earlier investment by Microsoft co-founder Paul Allen. TYZX is rumored to be profitable since the first investment. Industry experts believe that vehicles with 3D vision safety features can help better protect drivers and passengers in collisions, help cars avoid accidents, keep vehicles in appropriate road lanes, and prevent many accidental backup injuries and fatalities, among other benefits. "Depth is calculated by triangulation against a known pattern from the projector. The pattern is memorized at a known depth. For a new image, we want to calculate the depth at each pixel. For each pixel in the IR image, a small correlation window (9x9 or 9x7, see below) is used to compare the local pattern at that pixel with the memorized pattern at that pixel and 64 neighboring pixels in a horizontal window (see below for how we estimate the 64-pixel search). 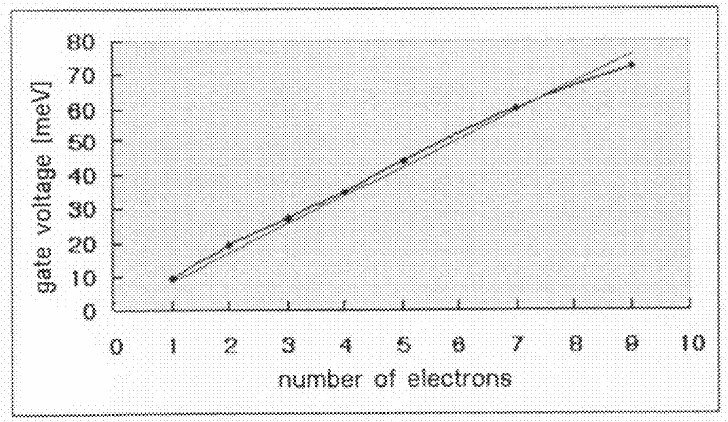 The best match gives an offset from the known depth, in terms of pixels: this is called disparity. The Kinect device performs a further interpolation of the best match to get sub-pixel accuracy of 1/8 pixel... Given the known depth of the memorized plane, and the disparity, an estimated depth for each pixel can be calculated by triangulation." CNN: The National Highway Traffic Safety Administration (NHTSA) proposes a new auto safety regulation that would require rearview back-up cameras in all new cars, pickups and SUVs by 2014. Based on the proposal, drivers must be able to see directly behind the vehicle whenever the vehicle is shifted into reverse. The rule would be phased in over the next four years, starting with 10% of new cars sold expected to comply with the mandate by Sept. 2012; 40% by Sept. 2013 and 100% by Sept. 2014. The agency estimates that the addition of rear-view camera equipment would cost between $159 to $203 per car, or $88 to $158 on vehicles already equipped with some sort of display screen -- like one used for navigation. NHTSA says the total approximate cost to equip their estimate of 16.6 million vehicles sold in 2014, would be between $1.9B and $2.7B. Taiwan Economic News: Cheng Uei Precision Industry, a supplier of connectors for electronic devices, TPV Technology Ltd., the world`s largest TV maker, and Pixart Imaging plan to set up a joint venture on production of optical touch modules, Guo Tai-chiang, chairman of Cheng Uei said. Industry insiders noted that the joint venture will source touch sensors and ICs from Pixart and optical touch components from Cheng Uei, while relying on TPV`s enormous influence in the monitor industry to cash in on rapidly growing demand for Internet TVs and all-in-one PCs. TPV is expected to ship 15 million LCD TVs and 55 million units of LCD monitors and all-in-one PCs to sustain its No. 1 position in the industry this year. Albert Theuwissen published his experience of teaching the first "Hands-On Evaluation of Image Sensors" course. The 2-day course took place two weeks ago in Barcelona under CEI-Europe umbrella. Next time the improved version of this unique course will be delivered in May 2011 in Copenhagen. PR Web: Panasonic 3D ToF D-IMager is now available for purchase through Arrow and Digi-Key. Hynix announced 1/6-inch 1MP 720p/30fps HD video sensor aimed to notebook market. The YACC611CBDFH (Hi-162) sensor outputs raw RGB and needs an external ISP. The sensor is based on 2.0um pixels and packaged in ShellUT CSP package. 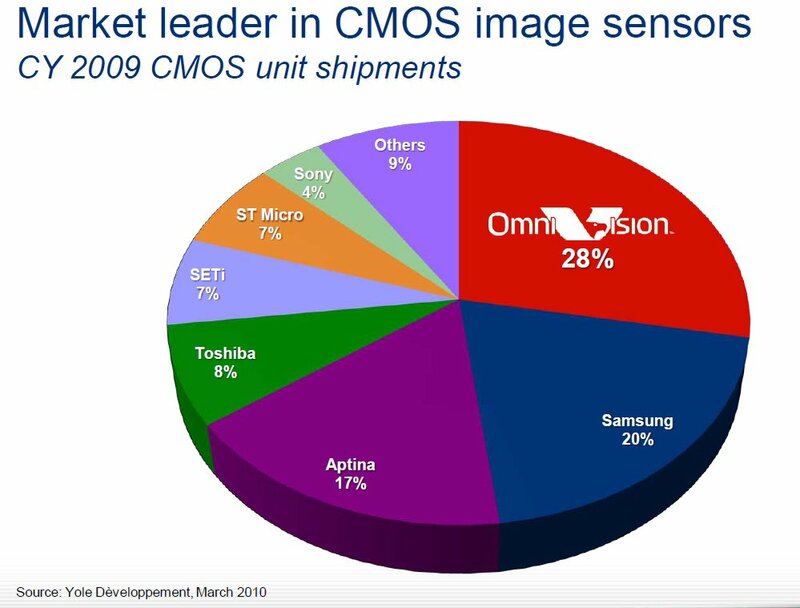 CMOSIS previewed 1/3" VGA (648 x 488) format sensor. The new CMV300 will use the same 8T pixel structure as the high-resolution series CMV2000/CMV4000 / CMV12000. With 7.4 µm square pixels, a noise level of 9 e- and a full well charge of 20,000 electrons, the new CMV300 realizes a dynamic range of more than 66 dB, which can be extended through several HDR operational modes. The CMV300 pixel architecture features its low parasitic light sensitivity and CDS in global shutter mode. The sensor's 12-bit ADC delivers 600 full VGA frames per second over four LVDS outputs of 600 Mbit/sec each. CMV300 comes in a monochrome version fitted with micro lenses, and in a color version featuring RGB Bayer patterns as well as micro lenses. Prototypes will be out by mid-2011. Hugo Gaggion, Sony Broadcast & Professional Solutions CTO, presented 2K/4K roadmap at NYC 2010 HD World show in mid-October. 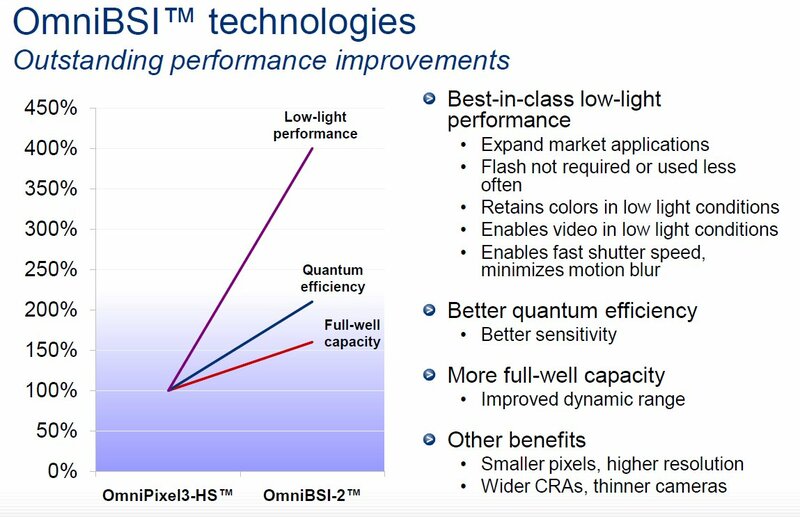 Sony published a video of this presentation discussing color filter pattern innovations, among many other things. Thanks to A.A. for sending me the link! Andor announced the launch of the Neo camera platform based on scientific CMOS (sCMOS) technology. 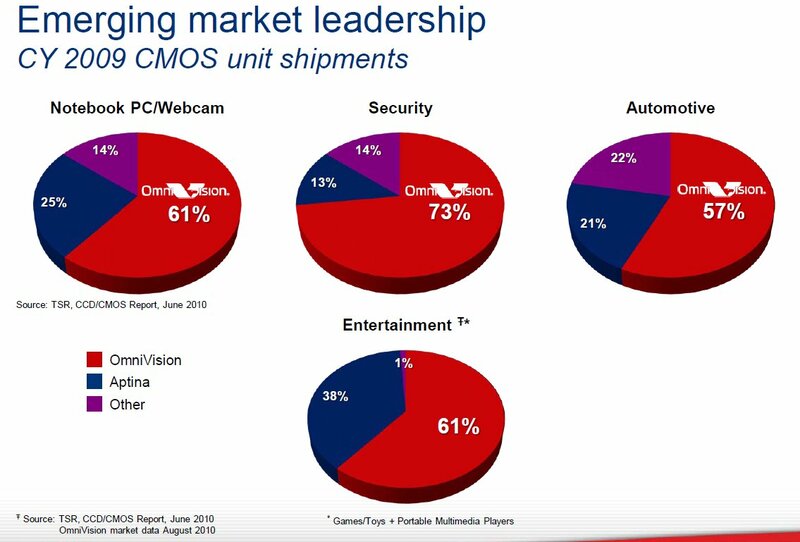 The company calls Neo sCMOS the most significant camera launch in the recent times. The sensor spec has been improved by TE cooling down to -40C. Specifically, the read noise went down to 1e- at 30fps full resolution speed and 1.4e- at 100fps speed (was 2e in not cooled sensor). Thanks to R.C. for sending me the info! PR Newswire: EV Group (EVG) announced that it has developed a new micro-lens molding process that can enable volume production of very-high-resolution (up to 8MP and higher) wafer-level optics for use in smart phones, pico projectors and other applications. The new Monolithic Lens Molding (MLM) capability, which was developed in-house by EVG's process development team, is available as an option on the company's IQ Aligner UV nanoimprint lithography (UV-NIL) system or can be upgraded to existing equipment. EVG expects to ship its first IQ Aligner with the MLM option in the first half of 2011. In wafer-level camera production today, glass substrates are typically used as carrier and spacer wafers for the lenses, which are composed of an optical polymer material. 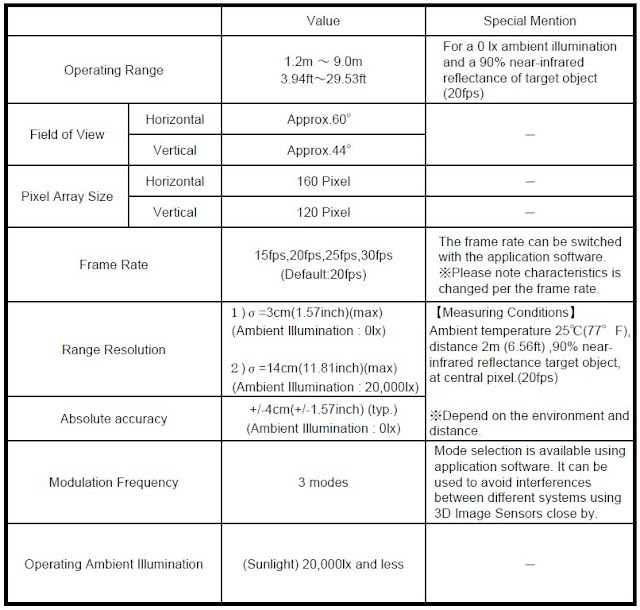 The different material characteristics of these components limit resolution and picture quality. EVG's MLM process overcomes this limitation by eliminating the need for glass substrates. Instead, the polymer is molded between two stamps and then cured with UV exposure by the EVG's IQ Aligner system. 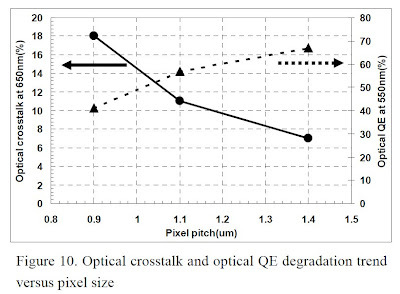 By omitting the glass substrates, wafer-level optics manufacturers face fewer constraints on the optic and lens stack design—enabling the production of thinner lens wafers and significantly shorter optical stacks. In addition, since the IQ Aligner molds the micro-lenses using a room-temperature UV-NIL process versus thermal imprinting, a high degree of precision alignment is achieved between the various elements in the optical lens stack—maximizing device performance. 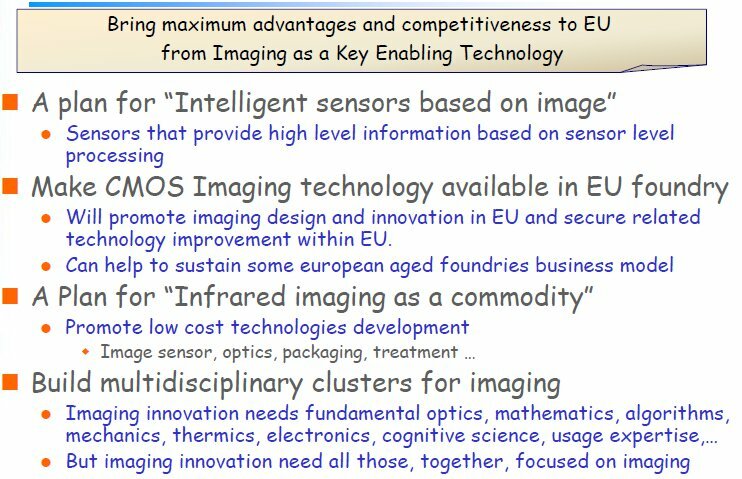 ...we shipped record volumes of image sensors exceeding 180 million units. 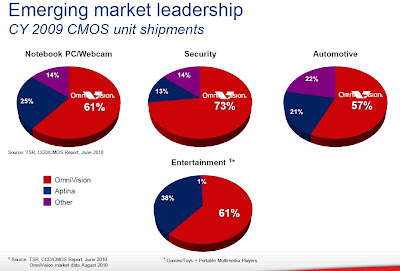 This is the highest level of units ever shipped by OmniVision in the first quarter. ...Now pursuing design wins for BSI-2 and we believe we are more than a generation ahead of most competitors. 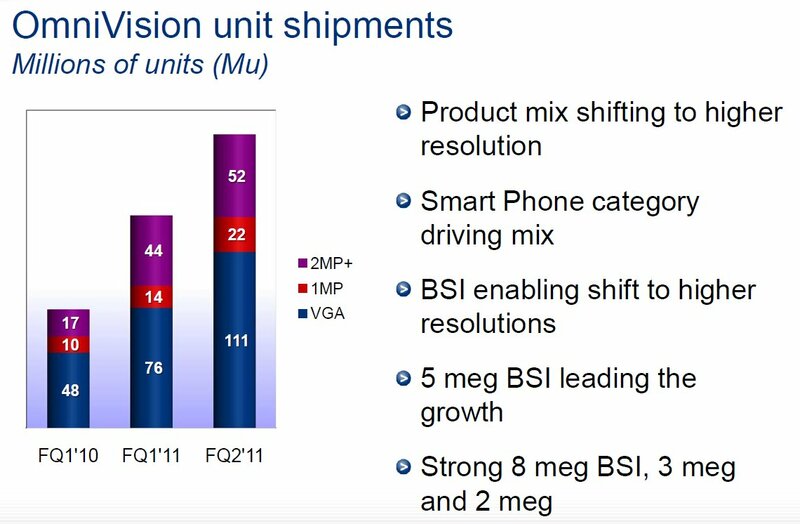 We anticipate shipping BSI-2 based products in the next calendar year. ...our CameraCube products are gaining traction and we are shipping those products in steady volumes. In our second fiscal quarter we shipped a record high of nearly of 185 million units as compared to 134 million units in our prior quarter. The average selling price in our fiscal second quarter was $1.29 as compared to $1.44 in the prior quarter. The sequential drop in the average selling price was driven by the shift in our products mix mainly due to a surge in shipments of our new BSI HD sensor OV9726 and our new specialized VGA product of the OV3738. These chips are ... smaller in size and therefore carry a lower ASP. ...OmniBSI has been adopted ... by all Tier 1 customers in all segments. ...we're going to refrain from breaking out too much detail in regards to our specific plans around BSI-2. ... we are extremely, extremely pleased with the engineering progress that has transpired with this platform. We are extremely pleased with the product developments that are directly taking place today and we're very, very pleased with our engagements with Tier 1 leading customers to adopt Omni BSI-2. All that being said we're lining up for some time within the next calendar year to start ramping up production and ramping up initial projects with customers. I would say sometime in the early, the latter half of the Q2, Q3 timeframe calendar year next year would be the ramp of some of these activities. BNR quotes Reuters saying that Anterion initially aimed at an IPO in the third quarter of this year. Early next year it must be clear how soon that step can be realized. Partly to the poor stock market climate, the company has decided to attract a strategic investor - Qualcomm. Meanwhile, this year for the first time since its separation from Philips in 2006 Anteryon has shown profits on a turnover of around 20M euros. The company expects that sales will grow next year. Anteryon supplies its wafer level lenses to all major mobile phone brands including Nokia, Samsung and Motorola. 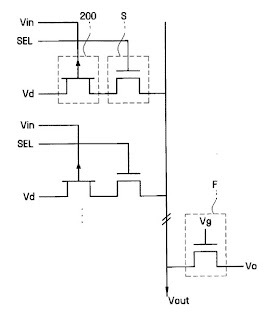 The ZCD-based circuits are said to consume one to two orders of magnitude less power than op-amp for the same settling time and accuracy. Now power numbers are given in the article, while white papers published on the company's site suggest much smaller savings.